Step 1. 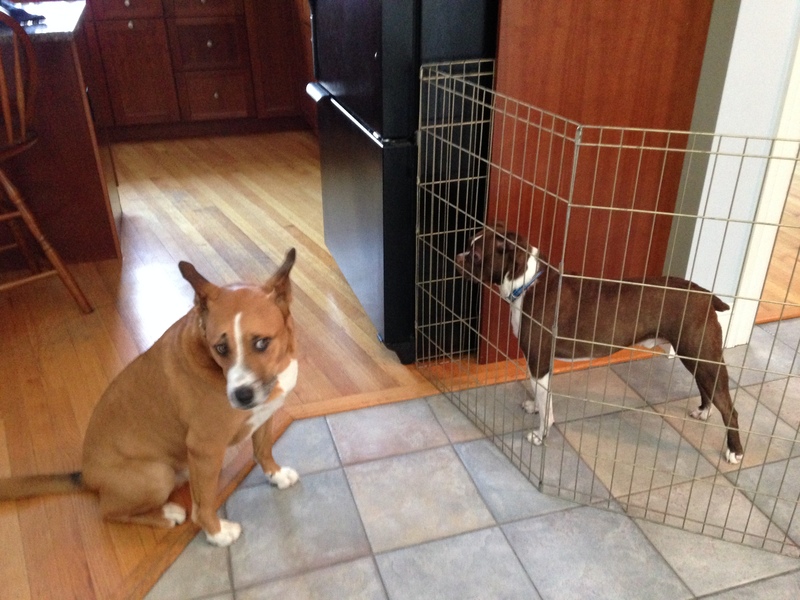 Management; prevent your dog from practicing the unwanted behavior. Step 3. 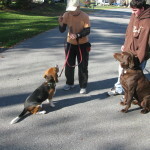 Bite Prevention; understanding your shy dogs Distance Cues. Step 4. 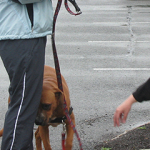 Emotional Control Exercises; helping your dog have better impulse control. Step 5. Adding Criteria; discussed below. The dog has a choice to follow the person as they treat and retreat backwards. Adding Criteria in general: Now that your dog has better emotional control in quiet settings, I recommend you begin to add some criteria to your training in very small steps. When training fails it is often because we humans want the behavior to be corrected or stopped without changing how the dog feels. 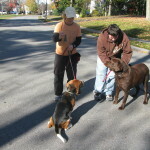 Small criteria additions would be training your dog in your driveway or yard, staying a safe distance from the street. If you are in a city environment, then begin this step inside the house near a window, inside the front door or in the back yard. 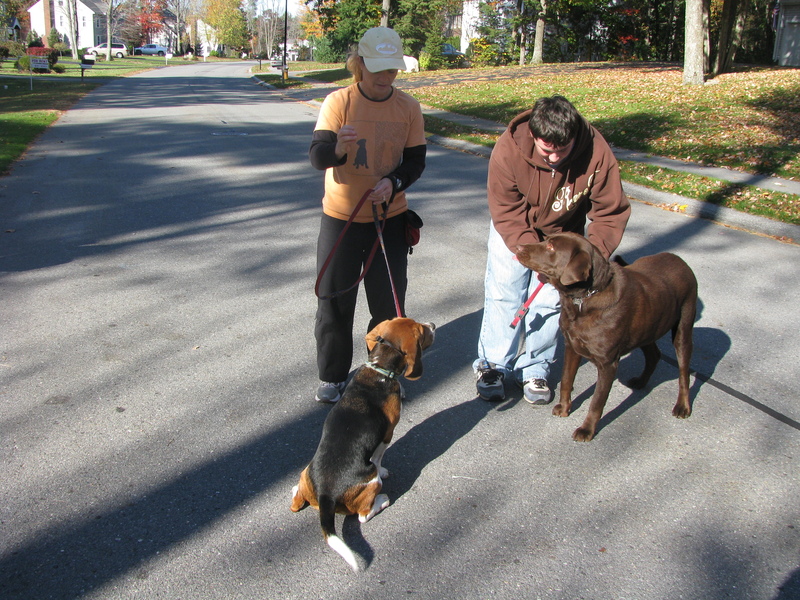 Another option is to drive your dog to a safe location at the end of your street where you have a friend waiting with instructions on how to toss a treat at your dogs feet, and then toss one further away as you walk a bit. Have a successful short training session then return home to relax. Adding Criteria with guests: If your dog is highly aroused inside the front door, begin your training with a guest outside your home or down the street, as your dog needs to be in a thinking brain for desensitization to work. If your dog is on a leash, be sure the leash is slack and the handler follows the dog, rather than directing the dog’s movements. This gives your insecure dog a choice in how close he wants to be to the stranger, which allows desensitization to be effective, and it allows you to constantly see how your dog is feeling. Pay attention to your dog and note the difference in his body language with guests in your home compared to on the street. 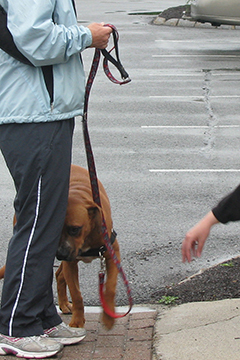 BEGIN training where your dog is calmer. If your dog gets stiff, begins breathing fast, growling, or barking, simply take a short break and move farther from his territory. When you begin again, increase the number of times you toss the treat far away so the dog does not feel like you are trying to “trick” him, as this will halt any desensitization you expect to accomplish. This process may take three or four session with the same person down the street before your dog can relax, that is fine, just go at your dogs pace. Adding Criteria in your home: As long as you are seeing your dog with a relaxed face and body outside your home, you can continue with your guest entering your home first, ahead of you and your dog, then continue the treat and retreat game, with your dog on a slack leash remembering the dog has a choice. Regardless of how the people are positioned (standing, sitting, moving etc.) the dog is free to approach or avoid at any time. The dog may choose to come into a person’s space or not, may choose to enter and stay in that space, or may choose to enter and then leave. 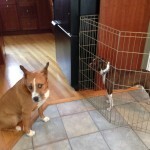 This process helps the dog feel safe because he is in control, preventing him from sliding into fight mode. 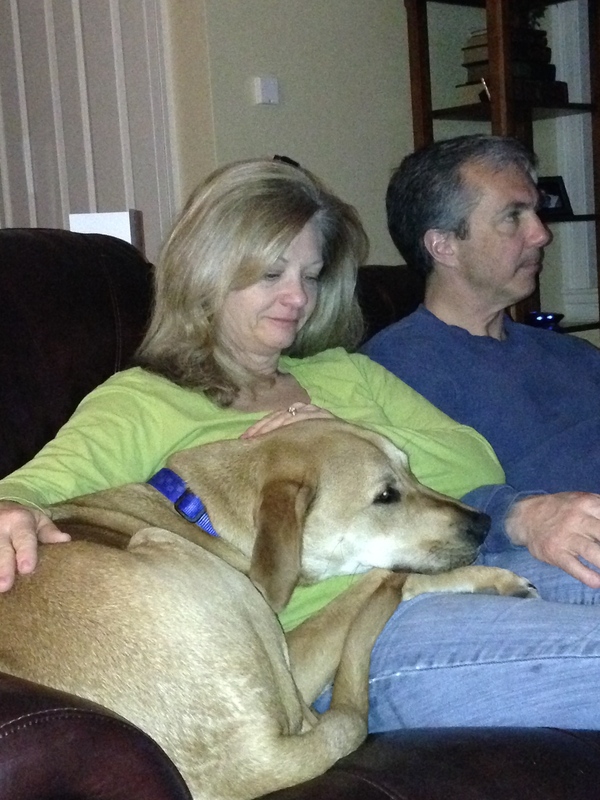 When your dog feels safe, he will be able to think and learn and associate your guest with a positive association. Time frame: Each dog will progress at a different pace and they can only go at their pace. Factors that change this time frame are how the person smells, how many guests you have, how tall they are, male or female, how fast they move, if they make direct eye contact, if they are nervous, if they lean over the dog too far or stomp their feet. If your dog goes over his comfort level, he may lunge and or snap, I do not recommend you punish your dog, simply slow the progression down until you reduce your dogs fear. 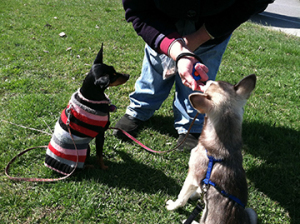 Reducing your dogs fear of humans will be a process if you own a shy or insecure dog. Your guests or friends participating in the desensitization process should be coached to not approach the dog, but rather wait for the dog to approach them to begin the treat and retreat game. Giving the dog a choice in the relationship will keep him feeling safe and in control so he is able to change how he feels about humans. This is Blog #3 of a 5 part series on how to prevent your dogs from biting a stranger using a positive approach. 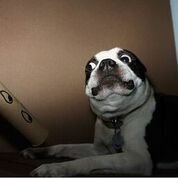 This Boston terrier is terrified as demonstrated by his wide eyes, ears drawn back, face turned away, lips pulled tight and closed mouth all show his fear.This is the third blog on how to help the dog who is barking and lunging at people using a positive approach. 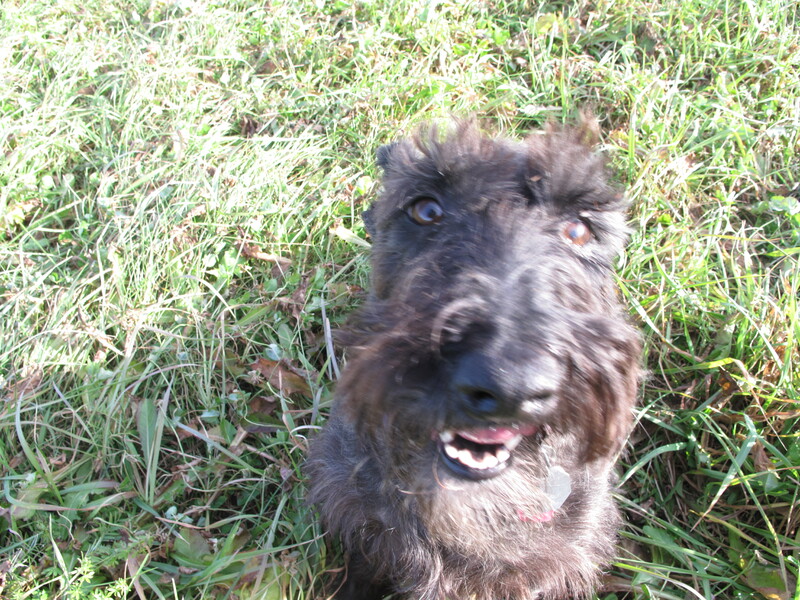 Blog #1 How to Stop Aggressive Dog Barking at People. Read Blog #1 I discuss the importance of good management; preventing your dog from practicing the unwanted behavior of lunging at people. 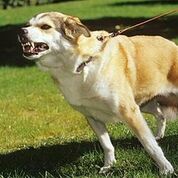 Blog #2 Dog Aggression Towards Humans. Read Blog #2 I explain how to desensitize and counter condition; or change how your dog feels about people. In this Blog I will teach you how to prevent your dog from biting a person by helping you understand when your dog is feeling stressed and needs more space from an unfamiliar person. Dogs will offer requests for distance, called distance cues until they learn that their requests go ignored by the human. If they are still afraid, they will simply bite as their fear overrides their ability to think. Distance Cues are body postures or signs your dog uses to tell strangers (and other dogs) they would like to have more space. These behaviors begin with the puppy and are called “shy dogs” and can include skittish behaviors such as looking away, leaning away, cowering, hiding under furniture, paw lifted, quick lip licking, and enlarged eyes with the whites of the eyes showing. The need for distance is apparent by this dogs lowered head, entire body leaning away from the hand, and his paw is raised in a submissive gesture. If you see your dog offer a distance cue then you need to help your dog by asking people to ignore your dog, back away or removing your dog from the encounter. Low level distances cues should never be punished, as this can result in a dog that is not allowed to express his fear, hence the dog may bite with no apparent warning. Forward stance with a show of aggression works. Some dogs learn that these distance cues are ignored by humans, so they simply avoid humans to avoid conflict. However, many dogs learn to use more aggressive cues and postures such as head up with a forward stance, growling, lip curling, air snapping, lunging and barking just to mention a few. 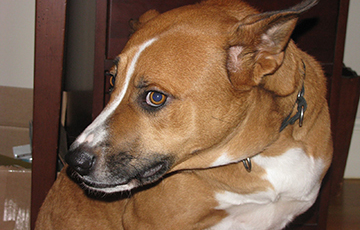 Sadly, I have had hundreds of clients tell me their dog used to be “shy with humans but is now lunging and snapping at them.” If a fearful/shy dog is not properly conditioned to see people as a source of good things, he may learn to use more forward body postures with a show of teeth, growling or air snapping. When a dog learns that this posture works, of course they will use it as it makes them feel safe. Unfortunately, if a fast moving person or child moves into a shy or fearful dogs space, your dog may not have time to show a low level distance cue and may bite as they simply did not have time to think, and they just reacted out of fear. Imagine when a bee flies at your face, many of you will swat it with your hand, right? Are you being aggressive or defensive? My experience is that most dogs bite in a defensive manner. This golden retriever mix has enlarged pupils, closed tight mouth, and stress signs around his eyes. Note the closed mouth, still body and the tucked tail. This dog is NOT asking you to pet his belly. Finally, if you are feeling overwhelmed with your dogs growly behavior towards your friend, or even a family member, think about this criteria. 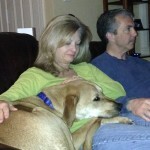 Learn canine body language so you know when your dog is feeling stressed. 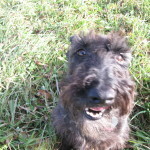 Many people contact me to help them with recall or getting their dog to come when they call them. 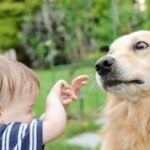 A good recall begins with a strong relationship between the human and the dog. The dog who happily comes when called shares a bond with them and trust them completely. They go to them repeatedly because they associate their owner with good things. If you call your dog and they look at you as if to say why? “Why should I?” It would be nice if relationships were that easy, but we know any relationship has a balance of trust and respect. Anyone parenting children can see similarities as we are able to say “because I said so!” Many of us have learned to give a specific reason, expressing our intentions clearly we will have better success and maintain a healthy relationship with our children in the process. When we put up a barrier or close the conversation with an intense emotion, we create a sense of frustration, anger or distrust which leads to avoidance. Avoidance is safer than engaging for a child or dog so they go in the back door or simply put their head down and ignore you. My foster dogs may think their name is come when they first arrive as they often earn their breakfast when they respond to “come” and then I release them to more freedom. Hence, conditioning them that Come is a good thing. My point is if you want your dog to come repeatedly, then reward generously as he is choosing you over that amazing smell in the leaves or snow, that he really would love to investigate. If he does not come, then I suggest you begin to walk towards him, the second he looks at you, you smile, get down low or bend forward and open your arms with clear intentions and a happy “yes” or click with your clicker and your dog will run to you with excitement much more consistently. If your dog begins to run to you, but stops 10 or 20 feet away, you can still reward this by tossing him a treat and walking away. Many dogs have been grabbed when they came close so may avoid being grabbed again as it was scary to them. Repeat, by calling your dog and tossing the treat again, then walk away, call your dog and get low offer the treat out to the side, quietly drop one on the ground and turn or move away. You are building a relationship build on trust. If you or anyone else has tricked this dog, he is smarter now and will not be fooled, never trick a dog or you lose trust and your recall will certainly suffer as a result. All my foster dogs are usually off leash within 1 week as I condition them that coming to me is 100% positive and feels safe. Enjoy your dog and remember coming when called is much more likely if you are not dominating, but building a trusting relationship. 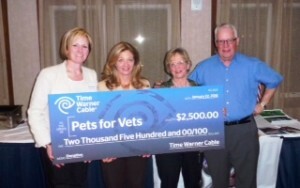 Pets for Vets Portland, Maine thanks Time Warner and Melinda Poore, VP Government Relations for a great evening held at the Inn By The Sea (pet friendly hotel, Cape Elizabeth). 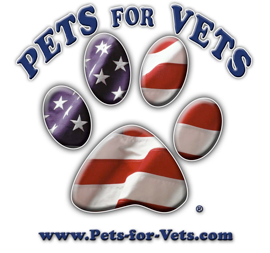 Judy Moore, PFV Head Trainer and Tom Targett, Chapter Director presented the Pets For Vets Mission and Process to the Legislatures of both houses. Raising funds for Pets For Vets, Portland Maine. Raising awareness for Pets For Vets, Portland Maine is certainly a noble cause, and the additional funds donated by Time Warner will help several veterans in need.